The exercises below involve detailed correlations using SP and Resitivity Logs. 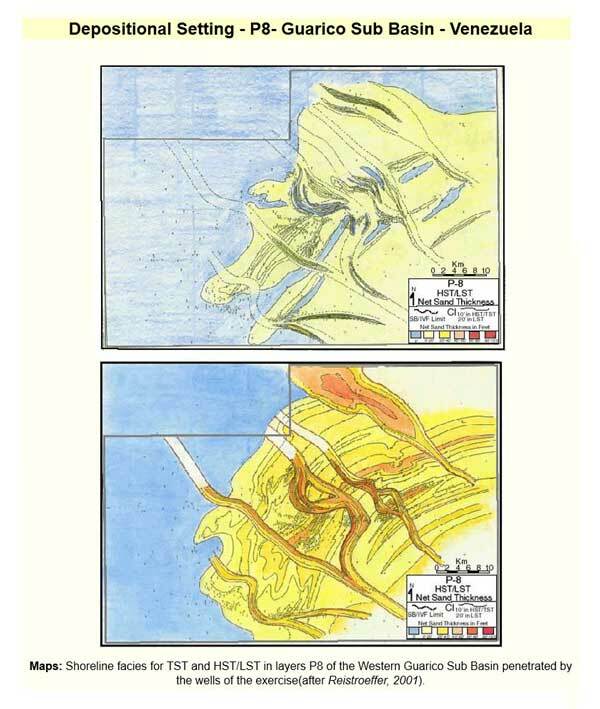 There two sets of these exercises and both are related to the interpretation of the local stratigraphy of the Lower Oligocene La Pascua formation of the Las Mercedes Field in the West Guarico Block of north eastern Venezuelan in which clastic sequences related to incised valley fill and their relationship to sea level. The first set are Exercise 1, Exercise 2 and Exercise 3 which cover a first pass with a well log data set from a limited number of wells for the top of the La Pasqua formation involving three sequences. These well logs are flattened on the top of a major transgressive surface (TS) on the silt marking the contact between the La Pascua below and the overlying Roblecito Formation. The correlation surfaces used in both sets of exercises extend across the area penetrated by the wells, except where they are interrupted by the incision of local channels. These surfaces cap silty horizons that are equated with surfaces of transgression (TS) that formed at wave base, and above, when the sea floor was reworked just following a sea level low. Normally radioactive peaks on Gamma Ray Logs, associated with mfs, are more extensive and would have been better surfaces but gamma ray logs were not available for much of the Guarico Sub basin. 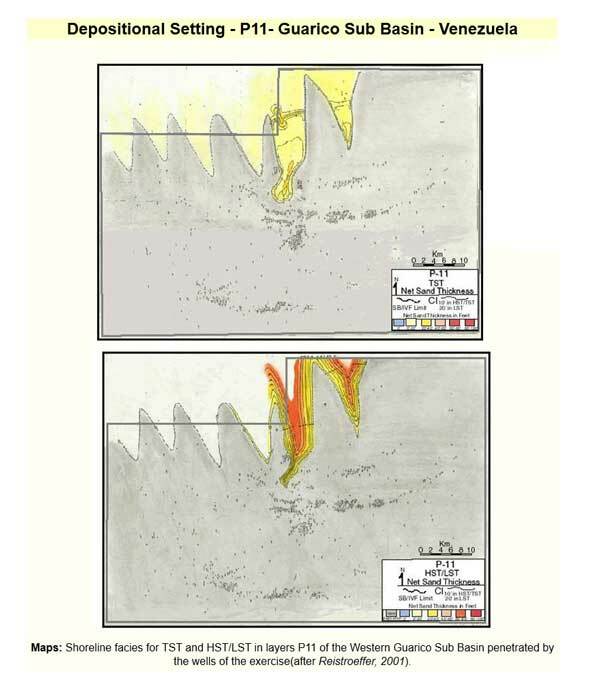 The strategy recommended for the exercises is to first identify additional surfaces capping through-going shales and silts and correlate these from well to well. Once the surfaces have been identified these should be used to separate and correlate parasequence sets (at the scale of feet to tens of feet). The vertical and lateral character of these parasequences (stacking patterns) is in turn used to interpret the depositional setting of the component systems tracts. 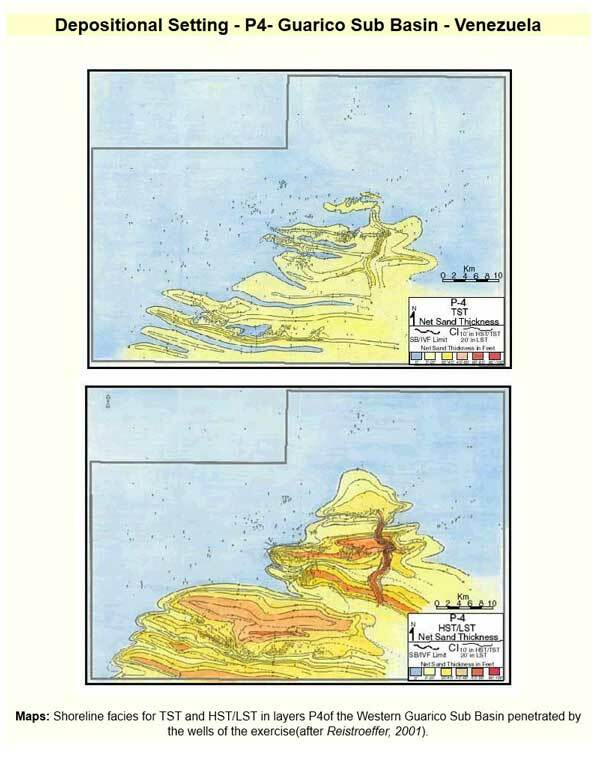 For instance these boundaries should be used to bracket the different parasequence intervals (as in the cross section displayed in the oval image heading this section) and then these parasequences are used to establish the sequence stratigraphy of the lower Oligocene La Pascua formation in the West Guarico Block. In the exercises it is assumed that parasequences identifed from the log character match universal and easily identifiable high frequency signals that can be used to correlate the marine and marginal marine sediments involved, particularly since the planktonic or palynologic biostratigrapic markers occur in only a few vertically dispersed shale horizons (Reistroeffer, 2001). The resulting parasequences have the same scale as the components of local hydrocarbon reservoirs. The parasequences have been interpreted, mapped and tied to high frequency eustatic events and then be used to find and exploit these reservoirs (Reistroeffer, 2001). 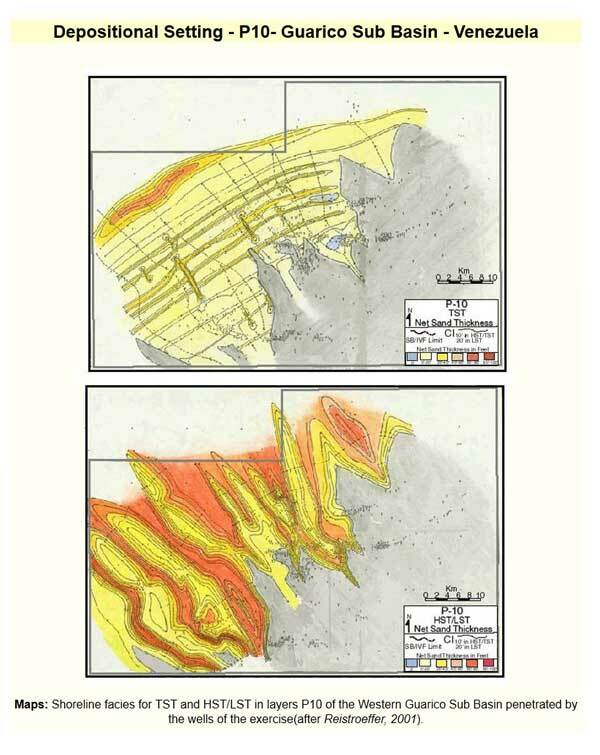 Interestingly the Rupelian aged section of the exercises has more stratigraphic sequences (Vail et al., 1977) than have been recorded on the eustatic charts of Haq, et. al. (1987). This is explained to be the product of high frequency variations in one or more of the principal variables that controlled the dimensions of the accommodation space. 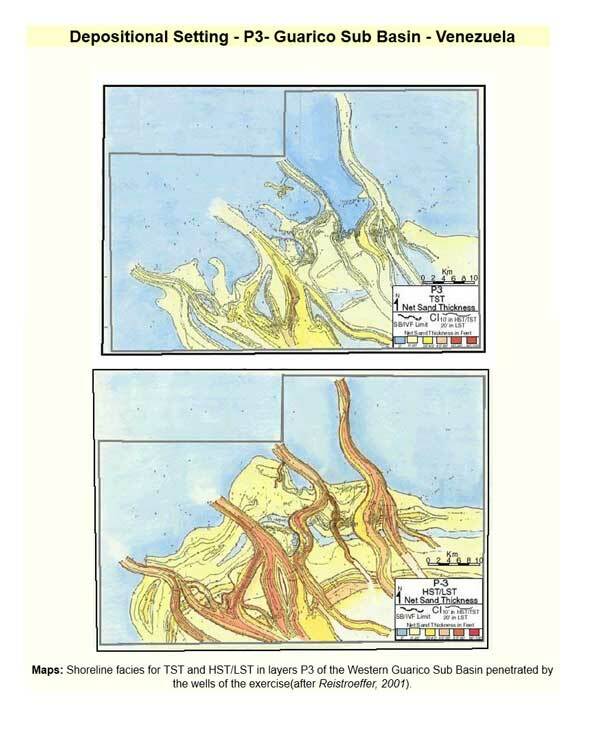 These variables include rates of subsidence (tectonics), sedimentation, and/or sea level. The economic impact of this high number of stratigraphic sequences is to increase the number of reservoir-seal couplets. Criteria to use in making a depositional interpretation - a Big Secret!!! 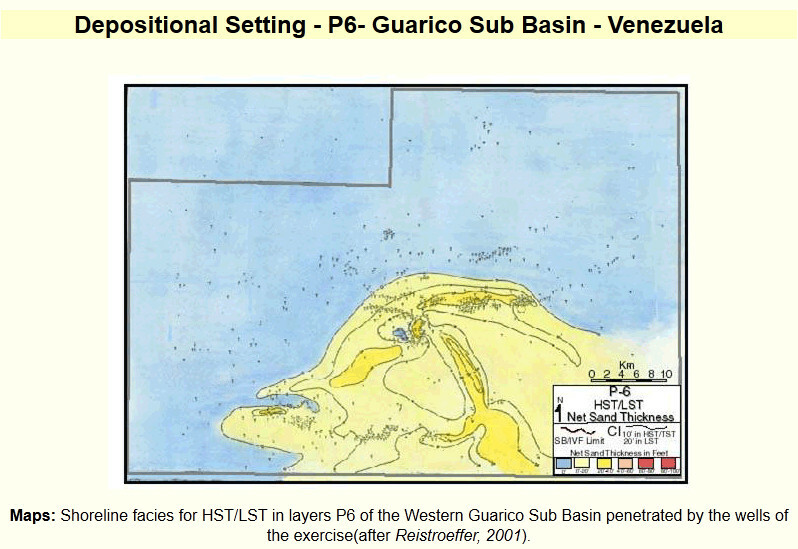 The purpose in providing a background on the regional geology of the Guarico Sub basin was to help extend the data of the wells. While the scientific method encourages the scientist to gather data, form a hypothesis and then test this with further observation, it should be recognized that only some of the data available is relevant and essential to determining the depositional setting of these rocks and their distribution. 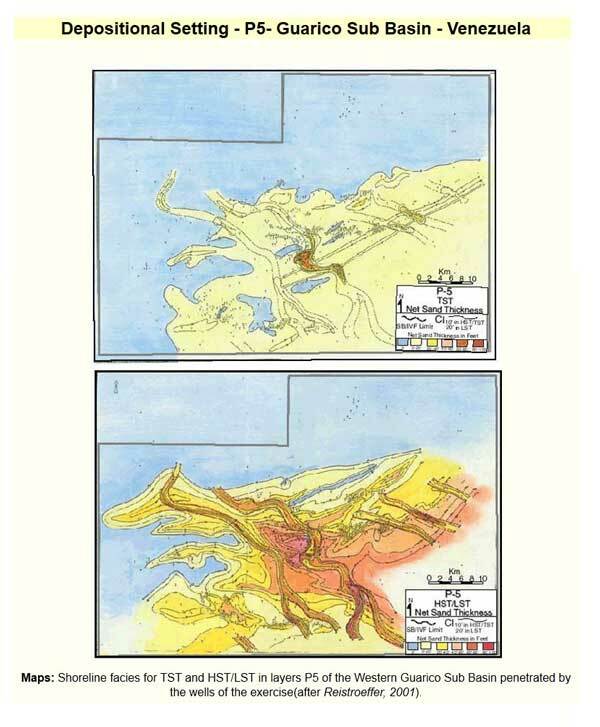 The experienced interpreter filters the noise from the data, looks for criteria that are considered essential to solving the problem at hand, proposes a geological model, and checks to see if the data matches that expected for that model. What are these magical essential criteria? They are often uncited since they are considered to be too obvious. These criteria vary from one geological problem to the next but in the interpretation of the sequence statigraphy of an area they will tend to be very much related to the regional setting of the rocks in question. The experienced interpreter will either already know this, or will read the relevant literature to find out what has already been established concerning the depositional setting of the sedimentary rocks in question. This understanding of regional geology will then be combined with a knowledge of vertical and lateral facies relationships in near shore clastic settings (eg. shoreline, beach, stacked beaches, tidal flats, deltas) and Walther's Law, and used to build potential depositional models. The interpreter will then work with the logs using techniques similar to those explained in the exercise to establish the correct depositional model and a sequence stratigraphic interpretation should follow! Strike oriented wave-dominated detached-to-semi-detached high energy shoreface systems and barrier-island systems. Flood and ebb tidal delta, and tidal channel systems. Elongate dip-oriented tidal channel sands. incised valleys fill sands and massive-blocky, sharp-based widespread sands. The vertical relationship of these sands is delineated on the figure below. 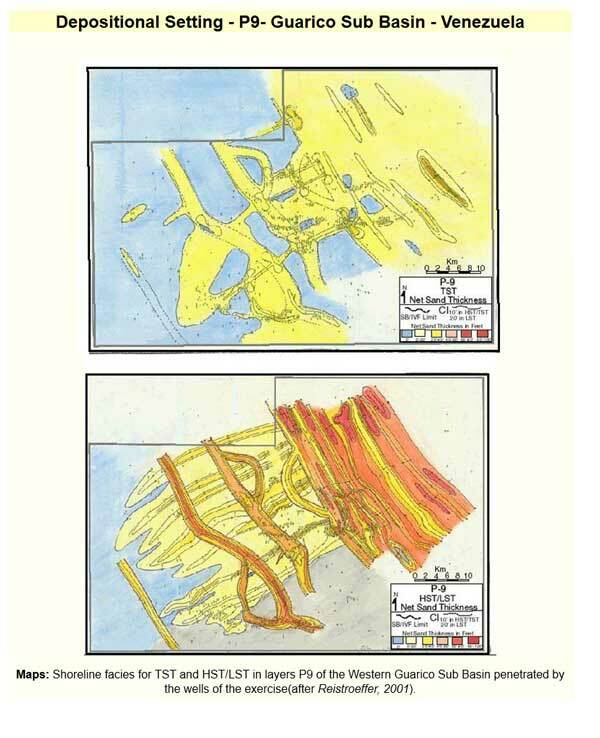 Click on the thumbnails to view the depositional maps Reistroeffer (2001) created. 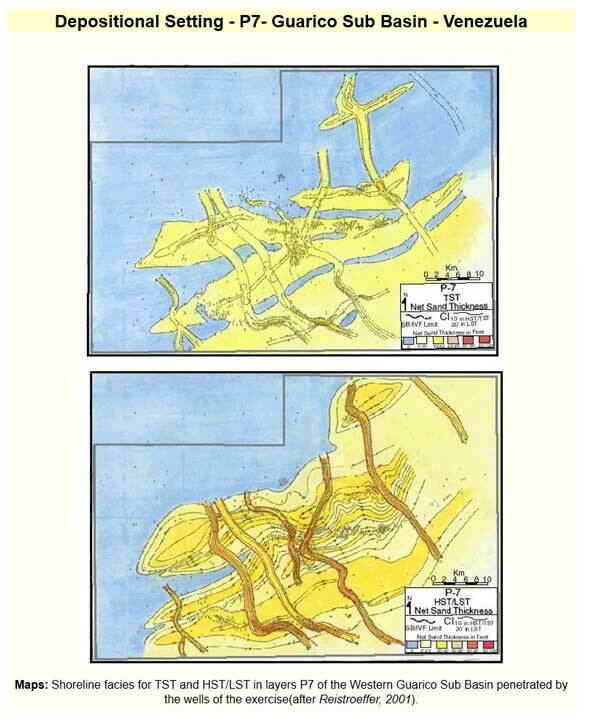 Diagram and maps of corresponding depositional settings by Reistroeffer (2001 ). Reistroeffer (2001) examined the character and stacking patterns of the E-log response to establish the origin of each of these sand bodies, or groups of sand bodies, relating them to particular rates of relative sea level rise, fall or stillstand. Reistroeffer (2001) found that the higher frequency fourth order eustatic cycles were superimposed on a third order cycles of sea level. As shown on the Figure above he found that the dimensions of particular sand bodies could be equated with their location on the third order lower frequency sea level curve.